Rony Colin, the Mayor of Croix-des-Bouquets, announced the construction of three new public places, which will bring to 15 the number of public places built or rehabilitated in the commune. In Bon Repos, the new public square will be built between the entrance to Lilavois and RN #1 and will include a kiosk for cultural activities, a basketball court and multimedia center. At the Crossroad Cesselesse the new square will be built on the road of Lilavois and will include a sports field and a walking area. In the Marie Madeleine area in Marin will be built the 3rd public square which will include a basketball court, a wooded area and various infrastructures. 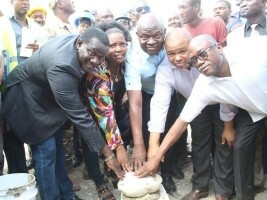 Construction work on these three new public infrastructures was launched on Wednesday, February 6th.